The Tales of the Knights, contain collection of popular stories of the Arthurian romances. They includes the tales of Sir Erec (Gereint), Sir Yvain (Owain) and Sir Gareth. There will be more tales in the future. The following tales were too large to be placed here, so I had provided separate pages for these tales. The first of the Arthurian romances written by Chretien de Troyes in c. 1170, was called Erec and Enide. The number of versions written in other languages attested the popularity of this poem. The Welsh version can be found under the title, Geraint and Enid, which was one of eleven Welsh tales from the Mabinogion. The dating of Geraint and Enid remained uncertain, but most modern scholars now believe that Chretien's version was older of the two. The German writer, Hartmann von Aue, wrote his version, called Erek (c. 1190). I haven't read this. I have followed Chretien's version, because it was better written than the Welsh version. The story began on Easter at Cardigan Castle, when King Arthur wanted to hunt for a white stag, reviving a custom, where the winner who kill the white stag will kiss the most beautiful woman in court. Gawain informed the king that it was unwise to revive this tradition, since each knight think that his lady was the most beautiful. This would cause dissent and anger among them. However, with his decision made before the Round Table, Arthur refused to back away. In the morning, while the king and the knights went in the forest to hunt for the white stag, Erec, the son of King Lac, kept company with Queen Guinevere and her companions. Guinevere saw a knight with azure and gold armour, riding with a beautiful lady and a hunchback dwarf. Guinevere asked one of her companions to find out who the knight and lady were. When the damsel encountered the dwarf, he refused the damsel to talk with the knight and lady. When the damsel defied the dwarf, he slashed his whip at the damsel's face. The damsel was fast enough to catch the blow on the palm of her hand. The injured damsel returned to the queen, upset. Guinevere asked Erec to try to talk with the knight and the lady. Erec also encountered the dwarf. That day, Erec had only his sword but no armour. Erec received the same treatment as the injured damsel. The dwarf's whip landed on his face and neck. Though Erec wished to attack the dwarf for the assaults upon him and the damsel, Erec knew he could not hope to defeat the knight with only his sword, since he had not worn armour that day. Therefore Erec returned the Queen. Erec informed Guinevere he wished to follow the knight and lady, until he could find a place, to borrow the armour from another knight, rather than return to Cardigan. Erec hoped to avenge the injuries done to him and the queen's damsel. Erec left Cardigan and followed the knight and dwarf. At the end of the day, it was the king who caught the white stag. Arthur would have to choose to kiss the most beautiful woman in the kingdom. Many of the knights were discontent with this custom, since each believed his love were the most beautiful. Arthur recognising he had a problem, asked the queen for advice. Guinevere recommended that he should wait until Erec return. Gawain agreed with the queen. This would at least give the king two days to kiss the most beautiful woman in the kingdom. Erec followed the knight and the dwarf to the fortified town of Laluth. Though the town was fairly poor, there were many knights in the streets. Erec discovered where they lodge for the night, so Erec also went to find accommodation. Erec arrived at a poor dwelling. The elderly vavasour greeted the hero and offered his home for the stranger. Erec met his host's wife and beautiful daughter. Erec fell instantly in love with the maiden. Erec learned from his host that he was the cousin of the Count of Laluth, however, he lost his land after his many wars, which was why they lived in poverty and couldn't properly dressed their daughter. Erec also learned from the vavasour that there was a contest for the beautiful, blue sparrow hawk held each year (kestrel in the Mabinogion's Gerient and Enid). Only a lady of great beauty can claim the prize. If another lady wish to enter the contest, her knight must challenge last winner. If the same lady win in three consecutive years, she may keep the bird. What interested Erec the most, was that the lady accompanied by the knight and dwarf that he had being following, had won the sparrow hawk from two previous years. No one had dared challenged her right to the prize, because of her knight, who was known as the Knight of the Kestrel, in the Mabinogion. Erec realised he has a chance to avenge the injuries done to him and his queen's damsel, if only he had an armour. The old vavasour was willing to offer his own armour to Erec. Erec asked for another boon from his host; he wished to take the vavasour's daughter to the sparrow hawk contest. Erec also told the vavasour of his wish to marry his host's daughter. The father was happy to give away his daughter in marriage to a prince. The mother and daughter were also happy. In the morning, after hearing the morning mass, Erec armed himself with the vavasour's armour. He rode his charger with his host's daughter at his side, riding the palfrey. Crowd had already gathered to watch the contest. The knight with azure and gold armour, was not expecting any challenge, told his lady to take the sparrow hawk. Erec immediately challenged the other knight. Neither knight would back away from the impending battle. The crowd cleared from the field, knowing that a battle was about to take places. Both knights equipped themselves with lances and ready their shield, before charging towards one another. In the joust, they were equally matched, since they were both unhorsed. The two strong knights leaped to their feet. They discarded their broken lances, and drew their swords. Both knights attacked each other with determination and skills. They fought for hours. Their shields were in tatters, and both knights received many wounds. Inspired by his love for the girl he only met last night, Erec attacked the other knight with renewed strength. Erec gained the upper hand when he dealt a blow to the other knight's head. While the blow stunned the other knight, Erec seized and ripped the helmet off the other's head. The other knight pleaded for mercy and allowing himself to become prisoner to Erec. Erec told the other knight as his prisoner; he must go with his lady and the dwarf, to Cardigan Castle. Erec learned that the other knight was Sir Yder, the son of Nut (in the Mabinogion, he was called Edern, the son of Nudd). Yder must place himself at Guinevere's mercy and as her prisoner. Yder must also recount what had happened in Laluth. Yder agreed to all off Erec's conditions; he immediately set out for Cardigan, with his lady and his hunchback dwarf. Erec had won the contest; his lady was allowed to receive the prized sparrow hawk. The Count of Laluth recognised his niece who was called Enide. The Count invited Erec to his home, which Erec refused. However, the Count and his family accompanied Erec, back to Enide's home. There was celebration in the vavasour's home not only of Erec's victory, but that Erec would marry Enide. Erec wanted to set out in the morning with his new bride for Cardigan. The Count's daughter thought that Enide's dress was too poor when she present herself to King Arthur. The Count's daughter offered to give her cousin, one of her own beautiful dress. Erec immediately refused, for he wanted his queen (Guinevere), to dress his new bride, when he return to Cardigan. So Enide's cousin decided to give her one of her best mounts as a gift. Erec promised his Enide's parents that they would received a new home, in one his father's strong castles, when Erec married their daughter. Everyone was happy. In the morning, Erec and Enide set out for Cardigan. Enide brought none of her belonging with her except the dress she wore previous night and the sparrow hawk Erec had won for her. When they arrived, Arthur and Guinevere happily greeted them. Guinevere had given her husband good advice, when she told him to delay to the customary kiss to a beautiful lady when a person killed the white stag in the hunt. No one from the Round Table doubted that Enide was one of the most beautiful maidens in the kingdom. Arthur bestowed a kiss to Enide. Erec was madly in love with Enide, and was impatient to have the wedding as soon as possible. Many lords attended the wedding, which was performed by the Archbishop of Canterbury. After they married, they stayed in Arthur's court. Erec took part in a tournament in which he distinguished himself in combat. Shortly after the tournament Erec decided it was time to return home with his new wife. Erec and Enide travelled to Ester-Gales, where Lac welcomed his son home. His father warmly welcomed Enide into the family. Erec and Enide, written by Chretien de Troyes, c. 1170. Gerient and Enid, one of Welsh tales in the Mabinogion (date uncertain). Geriant, Gereint (English and Welsh). Erec, Enide, Gawain, Guinevere, Arthur, Morgan le Fay. Enide was very happy that Erec had married her. In fact he had devoted so much time with her that Erec ignored what a knight normally do: hunting, tournament and adventure. Erec spends every single hour with her. Many knights were upset and talk among themselves, that their prince was no longer interested in warfare and adventure. They blamed her for Erec's inactivity. Enide who heard their talk were hurt by their comments on both her and her husband. However she feared to say anything to Erec. One night, she was so troubled by this problem that she broke into tears. Erec managed to persuade her to tell him what was bothering her. Though she told him the truth, he misunderstood Enide. He thought that Enide felt this way; he believed that his wife thought he was inactive and a coward. Erec told his wife to dress, while he armed himself. He had servant saddled his wife and his own horses. His father was puzzled and little distressed that his son refused all company for his mysterious journey, except for Enide. Erec and Enide left that morning. Erec ordered his wife to ride ahead and not say anything to him. Though Enide obeyed him, she ignored his order, when she saw three robbers set about to attack them, she warned her husband. Erec immediately rebuked her, for not placing more faith in his courage and prowess. Erec easily defeated the three renegade knights, taking their horses. Again, Erec told her to ride ahead, leading three extra mounts. He again ordered her not to speak to him until he spoke to her. As they rode away, they had not travel a league when another five renegade knights decided to kill Erec, and take his wife and his properties. Enide, who saw these bandits, became even more concern for her husband's safety, since they outnumbered her husband, five to one. Despite his order, Enide could not keep silence, warned her husband of another attack. Again, Erec rebuked her for disobedience and her lack of trust in his ability. Again, Erec defeated the bandits, and taken their horses. They travelled until nightfall, when they settled under a tree. Enide refused to sleep. Enide told her husband that she would keep watch, while he slept. Enide berated herself for telling Erec what his father's men said. She was feeling sorry for herself. In the morning they travelled until they met a squire who brought food to them. The squire had seen them travelled towards the castle of Count Galoain. The squire directed them to an inn in the castle. Erec rewarded the squire with one of the warhorses he had captured. When Count Galoain saw his squire stabling his new horse, he asked when his squire acquired the horse. The squire told his lord of the generous knight and the beautiful lady. Count Galoain went to meet Erec and his lady. Though the Count was courteous to Erec, he lusted after Enide. Galoain tried to seduce Enide, who knew of his lecherous intention. She feared for husband's life. She pretended to accept his advance. She promised to be his wife, if Galoain would kill her husband in the morning. Galoain immediately agreed. As Erec slept, Enide was worried about Galoain determination to kill her husband and force himself upon her. At daybreak, Enide woke her husband and told Erec of Galoain's intention. Erec realised that she was loyal to him. Erec told her ready for the travel. Erec compensated the innkeeper for waking him, by giving him all the chargers he had captured yesterday. They immediately set out. Count Galoain arrived where Erec lodged, but found that they had already left. Galoain realised that Enide had made a fool of him. He immediately ordered his hundred men to pursue the couple. Before Erec and Enide could reach the forest, Enide warned him again of the men pursuing them. Again he rebuked her for her warning. Erec immediately turned back and ran his lance through Galoain's seneschal, killing him. Erec then encountered the Count, who struck the hero in the chest, without breaking the links of his hauberk. Erec unhorsed and seriously wounded Galoain, since he had foolishly not worn armour. Erec immediately turned back and headed into the forest with his wife. Galoain's men thought to avenge their lord and seneschal, but Galoain ordered them to turn back. He believed that was God was punishing him, for trying to seduce Erec's loyal wife. Erec and Enide rode until they came upon the Pointurie Castle that belonged to King Guivret the Short. Guivret immediately challenged Erec. They fought and seriously wounded one another. When Erec defeated Guivret, the king surrendered. He offered his physician to heal him and the hospitality of his home. Erec refused his offers, but asked that if Guivret ever heard he was in trouble, that he should come to his aid. Guivret agreed. Erec and Enide left Guivret and travelled until he came to the forest where King Arthur's court was holding a hunting trip. Sir Kay, who had borrowed Sir Gawain's horse, challenged Erec, whom he did not recognised. However Erec did recognised Kay and Gawain's warhorse. Erec easily unhorsed Kay. Rather than keep the charger, he ordered Kay to return the horse to Gawain. When Arthur and Gawain knew that it was Erec who had defeated Kay, king send his nephew to invite with them. Gawain failed to persuade Erec visit Arthur, because the hero refused to stop until nightfall, even though he was wounded. Gawain sent one of his squires to return to Arthur and told the king to travel three leagues from where they were camp and set up a new camp ahead of Erec and Enide. When it was time to rest for the night, Erec realised Gawain had cleverly made the hero spend the night in Arthur's new camp. Arthur and Guinevere warmly greeted Erec and Enide. Arthur's sister, Morgan le Fay used her ointment and healed Erec. Though Arthur wanted Erec to stay with him for a week so his wounds could heal, Erec stubbornly refused to rest his body for more than one night. In the morning, Erec and Enide left the camp, despite Arthur's and the queen's pleas to stay longer with them. The couple travelled the forest until they heard a cry from a damsel. Erec told Enide stayed here, while Erec went to investigate the damsel who was in distress. The damsel told of the plight of her lover and knight, who was taken as prisoner by two giants. Erec promised to help save the damsel's knight. Erec found the knight had been stripped naked and had taken a serious beating from the giants. Erec challenged and after some hard fighting, killed the giants. The hero released the prisoner, and took the injured knight back to the damsel. Erec then hurried back to Enide, but his wound that he had taken in the previous days, reopened. Erec lost conscious and fell off his horse. Enide thought her husband had died; she was disconsolate and overwhelmed by her grief. Enide was about to kill herself with Erec's sword when a count arrived. The count took the sword away from her. The count promised that he would have her husband's body interred. The count took the Enide and Erec's body back to his castle. The Count Oringle of Limors thought that Enide was the most beautiful woman in the world, that he would marry her, even against her will. Enide rejected the count, but Oringle refused to listen. No one would come to her aid. The priest was performing the wedding ceremony of the count and Enide, but Enide keep crying that she wanted to die with husband. The count became angry and slapped her face. Erec had regained conscious when he heard Enide crying and the count yelling her. Erec got up, drew his sword and struck off Oringle's head. You can imagine what the wedding guests thought of this. They thought the demon had taken possession of Erec's body. Instead of arresting Erec for murder of Count Oringle, the people fled in terror from Erec. Even hard-bitten knights would not face Erec. In matter of moment, the church was deserted except for Erec and Enide. Erec and Enide got on one horse and rode away from the castle. No one had the courage to stop them from leaving. Erec apologised to his wife for testing her loyalty and faithfulness. He apologised to her for putting her through such stress. Erec told her how much he loved her. Erec, Enide, Arthur, Guinevere, Gawain, Kay. Guivret the Short heard news that Erec had been wounded and that Count Oringle was trying to force Enide into marrying him. Since Guivret had promised in friendship to Erec to come to his aid when he was in trouble, Guivret gathered his army to punish the count. Guivret encountered Erec, but did not recognise his friend. Guivret challenged Erec to joust with him. Erec was unhorsed. Enide prevented Guivret from attacking her husband, when she threw herself over Erec. It was only then that he recognised Erec and Enide. Guivret had the camp set up there, and had his physician to heal Erec's wounds. The next day Guivret returned to his Pointurie Castle with Erec and Enide as his guests. They stayed with Guivret until Erec had fully recovered. When Erec decided it was time to leave, and go to Arthur's court, Guivret decided to come along with them. One day they came upon a town. Guivret wanted to bypass the town, because of the evil custom practised there. Erec could resist any adventure, insisted that his friend to tell him about the custom. Reluctantly Guivret revealed the custom of the Joy of the Court. Erec then insisted that they stayed in the town, and that he wanted to experience the Joy, hoping to win great reputation as a knight. They were greeted by King Evrain, who invited them to stay his castle called Brandigan. After a splendid meal, Erec requested from the king that he would like to visit the Joy of the Court. Everyone in court became upset, especially the king, that Erec was seeking his own death by requesting the custom of the Joy. No matter how much Evrain tried to dissuade Erec from his path. In the morning Erec armed himself and was escorted to the Joy of the Court by Evrain. Erec tried to comfort Enide, who was anxious and upset about her husband's forthcoming battle. Erec came upon the Joy of the Court, where there was only one entry. Within the court there were row of skulls within their helmets, on the end of stakes. There was only spare pike and which a horn hanged around. The king told the hero that if Erec win the battle, he could blow the horn and break the spell and custom surrounding the Joy of the Court. If Erec loses the combat, his own head would hang on the unoccupied end of the pike. Erec fearlessly entered the Joy of the Court, and saw a lady seated in a lovely bed. Before Erec could go to the lady, he was confronted by a tall, strong knight, who immediately challenged him. Erec fought the other knight, who worn red armour, until he defeated the practitioner of the evil custom. Erec spared the other knight who told why the custom was practised. The knight told Erec that his name was Maboagrain and he explained that the lady who Erec saw on the bed had trapped in this custom. When they were both young they were in love, he promised that he would stay with her. Despite that he did want to take part in the custom, he had no choice but to fight with each knight who entered the Joy of the Court. Maboagrain would only be allowed to leave, when a knight defeat him and blow the horn. Maboagrain told Erec that the custom could only be ended when Erec blow the horn. Erec went to the horn and blew on the horn. The spell was broken. Maboagrain was freed to leave the Joy of the Court. Everyone wept for joy now that the custom had come to an end. Everyone except the lady on the bed, who cried for the loss of her lover. Only Enide went to comfort the lady. Her words did bring comfort to the girl, because she found out that Enide was her custom. For four days, everyone in town celebrated the ending of the custom in the Joy of the Court. Erec decided it was time to leave. Erec and Enide left the town with Guivret the Short. They arrived in Arthur's court, where the king and Guinevere happily greeted their friends. Arthur asked Erec to stay with them, which the hero only agreed if Guivret was allowed to stay with them. Arthur readily agreed with Erec's proposal and welcomed Guivret the Short to his household. Seven years later, Erec was staying at Tintagel when he heard news that his father had died. Arthur and the whole court went to Nantes, in Brittany, where Erec was crowned king and Enide as queen. The popular romance of Yvain and the Lady of the Fountain (Laudine) was told in several countries. This tale told here, was written by the French poet, Chretien de Troyes (c. 1170), called Le Chevalier au lion ("Knight of the Lion", also called "Yvain"). Its popularity can be attested by the fact that it was written by a number of other authors, who had written them in different languages. The same work can be found under the Welsh title - The Lady of the Fountain, which is found in a collection of Welsh tales known as Mabinogion. Here the hero was named Owain (Welsh for Yvain). There is also an English version written in 1350, titled Ywain and Gawain. And also a German version called Iwein, was written by Hartmann von Aue (c. 1202). I have followed the French version, written by Chretien, mainly because I found that it was better written than the Welsh version and, that I don't have the other versions. The story began on Pentecost, how a knight from King Arthur's court, called Calogrenant (Cynon in the Mabinogion), who discovered a magical spring in the middle of the woods. Sir Kay's insults and surly tongue had forced Calogrenant to tell of a shameful story of how he was defeated by a knight in those woods. Queen Guinevere who listened to Calogrenant's adventure, rebuked Kay for his brusque nature. Calogrenant was searching for a new adventure when he was directed to the magical woods. At the spring, there was a gold basin and a large block of marble beside the spring. If someone pour the water on the marble, a fierce storm would suddenly break out. A knight, who was lord of a castle nearby, was protector of the spring. This knight, named Esclados the Red (known as the Black Knight in the Mabinogion), attacked Calogrenant, unhorsing Calogrenant for using the spring. When Yvain (Owain) heard his cousin's tale, he promised to avenge Calogrenant. However, King Arthur told the court that he would invade this land for attacking one of his knights. Yvain wanted to defeat this knight, so sneaked out of Camelot and headed for the spring his cousin had described. When Yvain arrived at the spring and used the gold basin to pour water on the stone, a sudden storm appeared out of nowhere. For a moment Yvain feared for his life, but the storm abated as suddenly as it appeared. A knight came out of the castle, and immediately attacked Yvain. The battle seemed evenly matched until Yvain delivered a mighty blow to his opponent's head. The other knight realised he was mortally wounded, fled towards the castle. Yvain would need proof that he had defeated the Black Knight, so he immediately pursued his enemy. Yvain almost captured the enemy knight, when a portcullis closed on him and killed his horse. Yvain found himself trapped within two gates, with no escape possible. However a damsel arrived through a hidden door and found Yvain. She immediately recognised him, and told him she would help the hero. The damsel named Lunete (Luned) gave Yvain a magic ring that would make the wearer invisible. She told him that as long as he keep quiet and don't move about, no one would be able to see him. Lunete warned him that the people of the castle would kill him if they were to find him. The people of the castle were acting like the mob when they searched the castle for the knight who had killed their lord. The mob became angry and frustrated when they could not find their lord's killer at the gates or any part of the castle. Yvain witnessed the lady and wife of the dead lord, weeping and mourning. Yvain immediately found in love the lady. Her name was Laudine, Lady of the Fountain. Yvain later learned from Lunete that the lady was the wife of Esclados the Red; they had only been married for six years. Lunete immediate saw what was happening to Yvain. Lunete decided to help Yvain woo the widow. Lunete set about in gaining the lady's confidant. She told the Lady that she need to immediately, because the spring (fountain) can't be left unprotected. Lunete told the lady that no one in this castle was suitable for the duties; she needed a powerful knight with exceptional courage and reputation as a warrior. Lunete told the Lady she knew just the person who would love her and perform his duties as protector of the fountain. Though Laudine was upset that her companion spoke of marriage so soon after her husband's death she knew Lunete had spoken the truth. But she was a little taken back, when she learned that the man Lunete had chosen was the knight who defeated and killed her husband. Laudine found that not only Yvain was handsome in appearance, but also she knew that Yvain was the son of King Uriens and one of the prominent members of the Round Table, King Arthur's court. With Yvain as her husband she would be guaranteed protection of her land against her enemies. Not only that she was won over by Yvain's love for her. She accepted him as her husband, and was soon married. Arthur arrived with his army, only to face a single knight. When Arthur recognised Yvain and heard the news that he was married, he was happy. Gawain was also happy of his cousin's marriage to the beautiful lady. During the celebration, Gawain found himself attracted to Lunete, offering the damsel his protection whenever she needed it. After a few year of happiness in his marriage, Yvain missed the excitement of adventure and tournaments held at Arthur's court. Yvain persuaded his wife that he wanted to attend the tournaments. Laudine, however, warned him to return by the end of one year, or else to never return. However, Yvain spend over a year and a half at Arthur's court, forgetting his wife and his duties to defend the fountain. A messenger, a damsel, arrived to rebuke the hero for his neglect. The damsel told Yvain that his wife did not want him back, because he had broken Laudine's heart. Before leaving Arthur's court, the damsel removed Yvain's wedding ring. Yvain upset by the news, left Arthur's court in shame. When Yvain walked into the forest, he tore his clothes and ran off. The guilt and shame caused him to lose his wit. Le Chevalier au lion ("Knight of the Lion"), also called "Yvain", written by Chretien de Troyes. The Lady of the Fountain, one of Welsh tales in the Mabinogion (date uncertain). Iwein, was written in German by Hartmann von Aue (c. 1202). Ywain and Gawain, written in English (c. 1350). Yvain (Owain), Lady of the Fountain (Laudine), Lunete (Luned), Gawain, Kay, Guinevere, Arthur. For over a year, Yvain, who lose his sanity, ran around the forest naked and ate raw meat, like a madman. A hero turned into a madman, having lost his love, becoming a wild man of the woods, was a common theme in the Arthurian legend. One day, weakened by hunger and lack of shelter, a countess and her damsel, discovered him, unconscious. The Lady taken pity on the man, who obviously lost his wit, returned to her castle. The lady had an ointment from Morgan le Fay that could heal madness. She instructed one of her damsels, to take ointment along with a spare horse and some clothes with her. She instructed the damsel to use sparingly the ointment on the madman's forehead and temples, only for it was expensive. The damsel did more than she was instructed, by rubbing the ointment over the naked hero's body. She then hid in the bush, waiting for the hero to regain conscious. When Yvain woke up, he was ashamed that he was naked, and then remembered why had lost his wits. He quickly dressed when the damsel, who had been hiding in the bushes, appeared before Yvain. The damsel took the hero back with her to her lady's castle. Yvain remained a guest of the countess, where he recovered his strength. One day, an army surrounded the countess' castle. The lady was known as the lady of Norison, which I assuming that Norison is referring to either the land or her castle (or both). The countess told Yvain, how she lost much of her land and her other castles to one of her neighbours. She refused to marry the Count Alier, who taken her land. Yvain asked for armour and weapon. Yvain challenged the lord. Yvain and Alier fought until the hero would have killed the count. Yvain spared Count Alier, on the conditions that the count return all properties he had taken from Yvain's hostess, and that he would never attacked the lady again. Alier had no choice but to agree. The countess tried to persuade Yvain to stay with her as her husband, but Yvain politely refused. Yvain left the generous hostess on that same day of his victory. As Yvain wandered through the forest, he was seriously contemplating taking his own life, when he heard the sound of fighting. Yvain went to investigate and found that a great dragon was attacking a white lion. Yvain immediately attacked the dragon, and help the lion to dispatch the giant serpent. The lion was immediately grateful of the knight's aid, and followed Yvain like his shadow. At first, Yvain thought his madness return, when the lion kept him company; killing wild game for the knight and keeping him warm when the hero went to sleep. Yvain travelled with his strange companion, when he met a distressed damsel. This damsel was looking for either Yvain or Gawain, to champion her cause. She was not other than Lunete, companion of Yvain's wife. Lunete have being accused of treason against the Lady of the Fountain by the Laudine's seneschal. The seneschal and his two brothers had accused Lunete that because of her advice, she had caused grief to Laudine (the Lady's estranged marriage to Yvain). If she could not find them, she would be considered guilty, and would be burnt at the stake. Yvain revealed his identity to Lunete, and told the unfortunate damsel that he would defend her case, by trial by combat against the seneschal and his brothers. The duel was to take place at noon. As Yvain went to find lodging in a nearby town, he came upon a partially destroyed town. He learned from his host, the news that a giant named Harpina of the Mountain (also spelt Harpin or Harbin), had killed the lord's two sons, and would kill his other fours sons, if the lord did not hand over his daughter for the giant to violate. Yvain also learned that the lord's wife was an aunt of his friend Gawain. Yvain promised to face the giant if the giant came early in the morning, otherwise he would have to leave to defend Lunete from execution. Fortunately, for the family, the giant arrived several hours before noon. Yvain immediately challenged and attacked Harpina. The white lion helped Yvain to fight the lion. The giant complained that it was unfair that he has to face a knight and the lion. Yvain had the lion confined in the castle. The giant gained the upper hand in the combat. The lion knew that Yvain was having difficulty against the giant. The lion refused to let Yvain died, ran to the top of the battlement, and leaped down from the wall. The lion began to help Yvain killed Harpina. The sons of the lord were released. They wanted to Yvain to stay to celebrate the death of the giant, but Yvain refused, because he had to fight another combat at noon. Yvain arrived in time, when the seneschal and his brother were leading Lunete to the stake. Yvain immediately challenged Lunete's accusers. No one recognised Yvain, because he was wearing full armour. However, as great a hero Yvain was, he was facing a three to one odds against the seneschal and his two brothers. But the lion again helped Yvain to face his opponents. Together they defeated the seneschal and his brothers. Since they had insisted that Lunete to be burnt at the stake, her accusers' were to be burned alive for failing to win the combat. Laudine, who had watched the combat, set Lunete free, asking her to serve as her companion again. She offered Yvain hospitality and her physicians to heal the hero's injury and his lion's wounds; Yvain politely refused until he was reconciled with the lady he loved. Laudine who did not recognised her husband, because he still wore his helmet, asked for his name. Yvain told him he was the Knight of the Lion. Yvain left and went to a nearby hermitage, to recover from his wounds. Lunete, who followed Yvain, told the hero she would do everything she could to reconcile Yvain with his wife. Lunete also promised not to reveal his identity to the Lady of the Fountain. Yvain (Owain), Lady of the Fountain (Laudine), Lunete (Luned), Gawain. The lord of Blackthorn had died, dividing the land between his two daughters. However the elder daughter took both land, disinheriting her younger sister. The younger sister went to Arthur's court to ask the king to mediate. The elder sister asked Gawain to champion her cause. The unfortunate younger sister could not find any knight who was willing to face Gawain in combat. The younger sister was given forty days to find a knight. The younger sister hearing of a new knight known only as the Knight of the Lion immediately set out to find this knight. After weeks of searching she found the Knight of the Lion. She pleaded with Yvain to help her win back the land her elder sister had taken away from her. Yvain agreed to defend her cause. As Yvain, the damsel and the lion travelled together, they arrived in the Town of Dire Adventure. Yvain was looking for lodging, but the townspeople tried to drive them away by being rude. Yvain learned that two demons had forced the king of Isle of Maidens as their prisoner, to send thirty maidens each year for sparing his life. To lodge at the king's castle, he must face the two demons in combat. These maidens were to live a life of servitude with little food and payment for their labours, until a knight rescued them from their plights and end the evil customs. Yvain promised the maidens that he would face and defeat the demons and put an end to the degusting custom. Yvain went to the castle, where the king invited Yvain. Yvain was shortly challenged by the two demons. However they refused to fight Yvain and the lion. Yvain locked the lion in one of the room. The demons immediately attacked Yvain. Yvain was no match when faced against the demons. Yvain could barely defend himself against the demons. The lion knowing that Yvain was in trouble, began to break through the door until it was freed. The lion immediately attacked one of the demons. Yvain killed the demon he was fighting. The other demon pleaded for mercy; he was willing to end the custom he had forced upon the town. The maidens were freed. The king wanted Yvain to accept his daughter in marriage, but Yvain refused. The king became angry and upset that Yvain refused to marry his daughter, until the king demanded the hero to leave. The younger sister then returned with Yvain to Arthur's court. Neither Yvain nor Gawain could recognise one another, since they wore different armours. Gawain and Yvain were close friends and cousins. They fought one another until both were exhausted and wounded. Due to poor lighting, they decided to continue the duel, the next day. However as they spoke to one another, they realised that they were fighting a friend. Both Yvain and Gawain admitted defeat because of their love for one another. Arthur decided that they both were defeated. Arthur forced the elder sister to return the property to the younger sister. The elder sister had no choice but to obey her king's settlement. She accepted her younger sister as her vassal. Yvain (Owain), Lady of the Fountain (Laudine), Lunete (Luned), Gawain, Arthur. Yvain stayed in Arthur's court until his wounds were healed before he secretly left with the lion. Yvain, who missed his wife, returned to the magical fountain. The Countess Laudine was concerned the fountain has been left defenceless for so long since her husband (Yvain) had left. She was concerned that without a strong knight to protect her fountain, any enemy can destroy her castle by simply causing a fierce storm. Lunete advised the countess to have the Knight of the Lion (Yvain), to defend the fountain. The damsel advised that the countess to offer anything to the knight; help the Knight of the Lion to reconcile with the lady he love. Laudine agreed. Lunete even had her swear upon the reliquary. Lunete had cleverly trapped her lady of swearing an oath she could not break. The Countess Laudine immediately send Lunete to find the Knight of the Lion. When Lunete arrived at the fountain, she was surprised to find Yvain there. Lunete was so happy, she broke the news to Yvain, that his wife had agreed to reconcile with him. Lunete immediately returned to the castle with Yvain, and brought him before his wife. Laudine was rather upset that Lunete had neatly tricked her into reconciling with her husband. She had no choice, but to forgive her husband for his transgression. Even after all the suffering he had been through from the separation, he was every happy to be reunited with the woman he love. The Lady of the Fountain did not remain angry for very long, because she was loved Yvain. They lived happily ever after. Yvain (Owain), Lady of the Fountain (Laudine), Lunete (Luned). The French poet, Renaud de Beaujeu (or Renaut de Bâgé), wrote Le Bel Inconnu in 1185-1190. It was the story of Guinglain, the son of Gawain, who was known as the "Fair Unknown". Le Bel Inconnu was a typical tale of the hero who search for his identity and his adventure in the Otherworld. The theme had been repeated many times in the medieval tales. Lancelot (Prose Lancelot from the Vulgate Cycle, c. 1227) and Perceval (Le Conte du Graal, c. 1180) were in the same situation, brought up by women, not knowing their names. They could only find their names by undertaking strange adventures. Even Gawain appeared in a tale where he was ignorant of his own name, until he won renown for a perilous adventure (such as the Rise of Gawain, c. 1250). There are other versions of the Fair Unknown (Gawain's son), where the hero was known by other names. Gawain had once slept with a fay, named Floree (Blanchemains or Ragnell), who begotten a son named Guinglain. Though his mother brought him up, she had only called him "Fair Son", so Guinglain never knew his name as he grew up. When he was old enough to assume arms, he left his mother, and arrived at King Arthur's court in Caerleon. The young man asked a boon from the king. Arthur agreed, so that day, the king knighted the stranger. When Arthur asked for his name, he informed the king he did not know his name. Arthur decided to name the new nameless knight as the Fair Unknown (Bel Inconnu). A damsel named Helie arrived in court, asking for aid. The Blonde Esmerée (Fair Esmerée), the daughter of King Gringas. Blonde Esmerée was the Queen of Wales, who had been transformed into a serpent by two sorcerers. Only a kiss from a brave knight could lift the spell from Esmerée. Guinglain asked for a new boon from Arthur; Guinglain had decided to undertake the adventure to release the enchantment from Esmerée. Arthur had no choice, but allowed the new knight to take this dangerous mission. Helie was upset that Arthur had allowed an inexperienced knight to return with her. Guinglain followed Helie as she left Arthur's court. She repeatedly abused the new knight, though Guinglain was unfailing courteous to her. 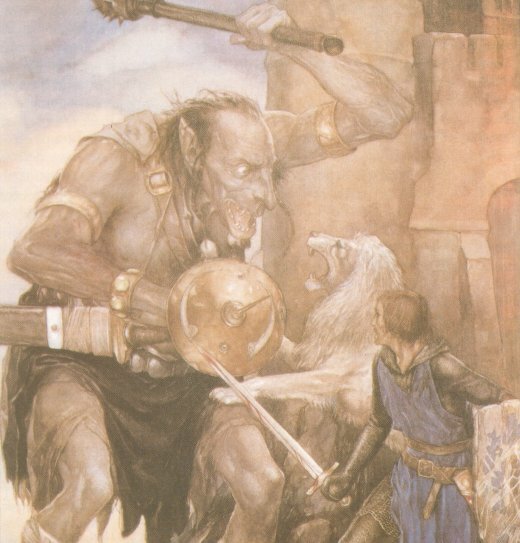 However, Guinglain proved his worth, as he fought enemy knights, and rescue the damsel from giants. By this time, Guinglain had earned Helie's respect. When they came upon Golden Island (another Otherworld), Guinglain had to fight a knight who wished to marry the beautiful lady of the island. Guinglain defeated and killed the knight. On the island, Guinglain meets and fell in love with La Pucelle, known as the Fée aux Blanches Mains (Fay of the White Hands), who was actually a fay. La Pucelle wanted to marry the young knight, but Helie reminded him that he had obligation to help her queen. They left the Golden Island. Guinglain came upon the Waste City of Senaudon. The hero had to fight with apparition and a knight. Guinglain killed the knight. A serpent came towards him, kissing the hero's lips. An unseen speaker revealed the hero's name was Guinglain, as well as revealing that he was the son of Gawain. The spell was broken, and Esmerée was transformed back to human form. The beautiful queen wanted to marry the young knight, offering him the kingdom. However, Guinglain was still in love with La Pucelle. Guinglain returned to the Golden Island, where stayed with lady for a time, as her lover. However, Guinglain eventually returned to the real world, and married Blonde Esmerée. Le Bel Inconnu, 1185-1190, written by Renaud de Beaujeu. Blonde Esmerée (the Fair Esmerée). La Pucelle aux Blanches Mains ("Maiden of the White Hands"). The Book of Sir Gareth can be found in Book VII of Morte d'Arthur, a work of the English author, Sir Thomas Malory (c. 1469). This episode was one of a few episodes that genuinely can be said to be the invention of Thomas Malory, without relying on older French and English sources. This tale is actually can be read independently of the rest of Malory's work, since it has no connection to the other books of Morte d'Arthur. Yet, the adventure of Gareth was one of the most typical of Arthurian story, because it used a common theme: mysterious young, who couldn't be identified, become knighted; winning a great name when he defeated great foes, in his quest to save a lady, whom the hero would marry. In many of the Old French romances, he was identified with Guerrehet. King Arthur was holding court in Kinkenadon, during the feast of Pentecost when two men and a dwarf accompanied a young man, who was tall, as he was handsome. His hands were large and powerful. The young man was clearly of noble lineage. The young man, who refused to give his name, asked for three gifts from the king, and that he would one gift now, and the last two after 12 months. The first gift that the young man requested was that he allowed to staying in the king's court for the twelve months, receiving as sufficient food and drink. The king agreed to the first gift. Sir Kay, Arthur's boorish seneschal, hearing this strange petition, rebuked and insulted the young man for being nothing but a gluttonous knave. Kay named the young man, Beaumains, which means "Fair-hands", told him that he could have food and drink in plenty, because the seneschal accommodated the young man in the poor quarters with the servants of the kitchen. Sir Lancelot and Sir Gawain were upset with the seneschal's ill manner and mockery, offered the young man finer quarter, which the young man politely refused. So for twelves, the young man bore Sir Kay's constant mockery and scorns with good grace, until Whitsuntide. The young man had also accepted Kay's new name for him. During the feast of Whitsuntide at Caerleon, a damsel arrived in his court with a petition. The young woman told King Arthur and his knights at the Round Table that a cruel knight, known as the Red Knight of the Red Launds has taken all of her lady's land, and besieging her lady in her castle. When the damsel refused to reveal her lady's name, Arthur told her that he had no obligation to send any knight to her aid. Beaumains hearing the damsel's message to the king, the young man spoke out. The young man asked the king that the 12 months has passed and told the king that he would now reveal the last two gifts he wanted from the king. Beaumains wanted this adventure to rescue the damsel's lady as one of the gifts; the other was that no other knights but Sir Lancelot of the Lake should knight him. The king agreed. The young woman departed in disgust that a young and inexperienced kitchen page would come to rescue her lady. While Beaumains quickly asked his two servants and dwarf to fetch his armour and horse. Beaumains was in such a hurry to follow the damsel, that he lacked only a shield and lance. Sir Kay still scorning the young man in his charge, hurried after Beaumains, hoping to teach him to respect him as his superior. Kay charged with his shield and lance ready, while Beaumains meeting the charge, drew and thrust his sword at Kay's side, unceremoniously unhorsing his tormentor. Kay lay on the ground, apparently unconscious. Beaumains then took the spear and shield of Sir Kay as his own. Lancelot, who witnessed the young man defeating the arrogant seneschal, was quite impressed. Beaumains asked Lancelot to joust with him, to test his mettle and his worthiness to become a knight. So they jousted and unhorsed one another. Then they drew their sword, and exchanged blows with one another. They fought to a draw. Before Lancelot would knight the young man, he asked for his real name. Beaumains revealed that his real name was Gareth, and that he was the youngest son of King Lot of Orkeny and of Arthur's sister, Morgawse. Which means that Gareth was also the brother of Sir Gawain. Gawain did not recognise his own brother, because Gareth was still a young boy when Gawain became Arthur's knight, fifteen years ago. Lancelot promised not to reveal Gareth's name to anyone at Arthur's court. Lancelot then knighted Gareth, who then quickly set out of the damsel. The damsel, like the rude seneschal, seeing that the young man was following her, scornfully mocked Gareth, telling him that this adventure was better suited for an experienced knight, not for an untried kitchen boy. The damsel ordered Beaumains to return to Arthur's kitchen. Beaumains embarrassed by her insults, courteously refused to be dissuaded from this perilous quest. So Sir Gareth resolutely followed the damsel out of Caerleon. Beaumain – Fair Hands (nickname). Book VII of Le Morte d'Arthur was written by Sir Thomas Malory. Gareth, Gawain, Lot, Morgawse, Arthur, Guinevere, Lancelot, Kay. Gareth travelled with the damsel, who constantly tried to shame the newly knighted hero, calling him a kitchen knave, and that she can't stand the smell. They encounter two knights at the ford, the damsel taunted him will he run away. Angry about her taunts, Gareth attacked and slew the two knights. Rather than praised his prowess, she claimed that one knight had fell off his horse that had stumbled. We learned much later that these were rogue knights, named Garrad de Breuse and Arnold de Breuse. When they encountered another knight in black armour, known as the Knight of the Black Launds, she told him to flee. The Black Knight asked the damsel if he (Gareth) was Arthur's champion to rescue her lady, she only reply that he was kitchen knave. So the Black Knight demanded that Gareth should get off the horse and take off his armour that he was not worthy to wear. Offended by the knight's scorn and embarrassed by his travelling companion, claiming that he was of noble lineage and would take the Black Knight's armour and horse from his dead body. So they jousted, where Gareth managed to pierce Black Knight's side. Despite this wound, the Black Knight fought fiercely for a whole hour, before he was overcome by his wound and fell off his horse dead. Gareth stripped off the fallen knight's harness, before following the damsel who had departed from the combat. Again, she insulted Gareth, saying that he smell like the kitchen, telling him to go away. Gareth told the damsel that he refused to be deterred from his quest. Then they encountered yet another knight, but this time in green armour. We learned that the Knight of the Black Launds was named Sir Percard, and his brother. The Green Knight, who was named Sir Pertelope, hoped to avenge his brother, but he was unhorsed, and then later defeated by Gareth's superior skill with the sword. The Green Knight cried for mercy, saying that he will even forgive Beaumains for his brother's death. Gareth told him that he would only spare him if the damsel say so, but despite this honour that Beaumains bestowed to the damsel, she seemed as she couldn't care less if Sir Beaumains killed the Green Knight or not. The damsel was surprise when the defeated knight offered to swear fealty to Beaumains, offering 30 knights in his victor's service. It was only then that the damsel told Beaumains to spare the Sir Pertelope. The Green Knight offered the hospitality of his castle to the travel-worn companion. Then the offensive damsel refused to sit at the same table with Sir Beaumains. Sir Pertelope was puzzled why the damsel constantly ridicule the brave knight. She did so, because she thought he was of low birth. In the morning that left the castle of the Green Knight, and encounter another brother, this time it was Sir Perimones, who was known as the Red Knight. The Red Knight hoped to challenge Sir Beaumains (Gareth). The damsel told the new knight that he was nothing but a kitchen knave (again) from King Arthur's court. She encouraged the Red Knight to fight and kill Beaumains, so she can finally rid of his company. When the Red Knight learned that he had killed one of his brothers and defeated the other, he set about to avenge them. But like his other brother, Beaumains defeated him too. Sir Perimones also offered to swear himself and his fifty knights to Beaumains. Once again, Beaumains would only spare the Red Knight only if the damsel intervened on his behalf. The damsel didn't hesitate this time to spare the Red Knight. Beaumains and the damsel stayed in Perimones' castle for the night and left the next morning. Once again, they travelled together until they met the fourth brother, Sir Persant of Inde, who was also known as the Blue Knight. The Blue Knight was staying at his pavilion at the large clearing of the forest. Again the damsel told him to flee from the knight, but he refused to leave her side, and was willing to challenge the Blue Knight. However, this time, the damsel was actually concern for Beaumains' safety. She realised that she hadn't been fair with Beaumains' courage, and she seemed apologetic. Beaumains courteous said that he wasn't concern what she said to him, because her insult had helped fuels anger when fight his enemy, seemingly to give him more strength to prove that he wasn't a coward. So when the two knights met, they jousted. However the force of impact was so great that not only did they break their lances on each other shields, but also their horses crashed into one another that they fell dead. The two riders were able to leap off their horses, before attacking one another with their swords. They fought for over two hours; each one was sorely wounded. Finally, Beaumains overcame his opponent, when he delivered a might blow to the Blue Knight's helmet, that left Sir Persant stunned on the ground. Tossing his battered shield aside, Beaumains ripped off his enemy's helm, and threatened to slay him. The Blue Knight pleaded for mercy, which Beaumains immediately accepted. Sir Persant welcomed Beaumains and the damsel to his pavilion. Here we learned the names of Persant's brothers. Like his brothers, Persant swore fealty to Beaumains. He had a bed prepared for Beaumains. That night, Sir Persant sent his daughter to sleep with the young knight. As she had been commanded, she lay beside Beaumains. He learned that she was daughter of his host and she was a maiden. Refusing to dishonour the maiden, he sends her back to her father. Persant then knew that he was a good knight of noble birth. In the morning, Persant asked his guests where they were going. The damsel told their host that she had brought this knight to relieve the siege of Castle Perilous that belonged to her sister. Castle Perilous had been under siege for two years. Persant knew of the Red Knight of the Red Launds, otherwise known as Sir Ironside, who has the strength of seven men. He also knew that Beaumains' guide must be Lynet (Lynette), sister of Dame Lyonesse. Lynet was otherwise known as Damosel Savage, because of caustic remarks to poor Sir Beaumains. His host also knew that the siege was intended to lure either Sir Lancelot or Sir Gawain to fight with the Red Knight. Beaumains revealed that his name was Gareth of Orkney to his host and guide. They departed from Persant's company and arrived at the hermitage. At Castle Perilous, a dwarf arrived with news that her sister (Lynet) was approaching with a knight, who might save her from the Red Knight. The dwarf had only to tell everything about the young knight's adventure, except his name, though the dwarf did reveal the knight was the son of King Lot. Dame Lyonesse sends the dwarf back with food and wine with silver cups for the knight and her sister. During the dwarf travelling back and forth between the castle and the hermitage, he met the Red Knight of the Red Launds (Sir Ironside), and the told the knight that he should be challenged by Sir Beaumains from Sir Arthur's court. The Red Knight seemed to disappoint that it wasn't Lancelot or Gawain. The next day, they approached the besieged castle. Beaumains saw some trees where many knights hanged by their necks. The Red Knight had killed every one of these knights, and hanged them like common criminal. The fallen knights suffered from shameful death, because the Red Knight hoped that the news will spread, since the Red Knight wanted to lure Lancelot or Gawain to confront him. As the Sir Beaumains and Lynet approached the besieging army, they found a great horn under a sycamore tree. The horn was made of the great tusk of an elephant. Lynet advised the hero not to blow the horn until noon, because noon the Red Knight has the strength of seven. Beaumains however ignored her warning, and immediately blew the horn at once. Lynet pointed out that not only his enemy was approaching, but that her sister was watching them from the castle. Even at this distant, Gareth admired Dame Lyonesse's beauty, and wished to become her suitor. The hero and the Red Knight exchanged a few words then prepared themselves for mortal battle. They charged at one another with their lance ready. They struck one another with such force that they both fell off their horses. On both sides, those of the castle and of the men besieging the castle, they saw the Red Knight unhorsed for the first time. The two fallen knights got up from the ground, set the shields before them and drew their swords. They traded fierce strokes with their swords until their shields were badly damaged, their armours rend and their numerous wounds bled. They had fought for hours, until both needed to rest. While Beaumains had his helmet off for a moment, he took the chance to see Dame Lyonesse on the battlement. The hero seemed to be refreshed. So they came upon one another, to do battle. The Red Knight dropped his sword, when he struck Beaumains' helmet, however the blow was another to make him fall to the ground, stunned. The Red Knight jumped upon Beaumains hoping to hold the hero down, while retreat his sword. Lynet cried out and her words gave him new strength. He managed to free himself, retrieved his sword, and knocked the Red Knight senselessly on the helm. Beaumains ripped off the Red Knight's helm, and raised his sword to strike off his enemy's head. The Red Knight yielded and asked for mercy, which Beaumains refused to give, because the Red Knight had given other knights, cruel and shameless death. The Red Knight told the hero that he was under oath by a woman he had loved, to lure Lancelot to fight him, because Lancelot had killed her brother. So the woman gave the Red Knight the strength of seven men, before noon. Beaumains would only spare the Red Knight, whom he now know as Sir Ironside, that he restore all the land to Dame Lyonesse, and begged Lancelot's mercy at Arthur's court. Sir Ironside agreed to all of Beaumains' conditions. While Beaumains returned to the hermitage to recover, Sir Ironside went to Castle Perilous, and restoring all the land to Dame Lyonesse, before departing for Arthur's court, seeking out Lancelot. Once Sir Beaumains (Gareth) regained his strength at the hermitage. Beaumains set about to Castle Perilous. However, the drawbridge was raised and he was refused entry, by none other than Dame Lyonesse. Dame Lyonesse told the surprised hero that he must seek adventures and glory for 12 months before she would allow him to enter her castle. Beaumains was distressed by her words, since he had thought that he had already won her hands in marriage. So he sadly departed in the company of his dwarf. The Dame Lyonesse told her sister Lynet (Lynette) and her brother Gringamore that she wanted to find out the real identity of her rescuer. So she send her brother to abduct Beaumains' dwarf, and bring him to another castle where they can interrogate the dwarf of Beaumains' true name and kinship. Gringamore found Beaumains sleeping near the water. Gringamore abducted and rode off with the dwarf, towards his castle at the Isle of Avilion. Beaumains woke at his dwarf's cry, hurried to pursue the fleeing knight. The dwarf revealed the truth that Beaumains' real name was Gareth the son of King Lot and Morgawse. Lyonesse was satisfied that Gareth was of royal lineage. Gareth arrived at the castle, demanding that the dwarf to be returned to him. Lady Lyonesse asked her brother to release the dwarf and invite Gareth to the castle. Then the Lady Lyonesse joined their guest; they instantly fell in love with one another. However, Sir Gareth didn't recognise that she was the Lady of Castle Perilous. When it was cleared they were in love and they knew truth of Gareth's true identity, they revealed that the young hero was worthy of his sister's love. They also revealed Dame Lyonesse's true identity, when Lynet appeared. Gareth and Lyonesse became troth plight. Rather than sleep in one of the chambers, Gareth, as advised by Lady Lyonesse, he decided to sleep in the hall. However, Lynet was aware that her sister would visit the hero in the night, rather than wait for their marriage, so Lynet sent a knight, who attacked Gareth, while the young couple were kissing and embracing one another. The knight wounded Gareth in the thigh, but the hero severed his attacker's head. Then Gareth lost conscious due to loss of blood and deep wound. Gringamore rushed into the hall when he heard Lyonesse's cry. Gringamore felt shame that his guest was attacked under his roof. As the brother and sister attended Gareth's wound, Lynet arrived. Lynet took the head, anointed the neck with ointment, and then joined the head to the body. Immediately the dead knight rose and went into her chamber. The next night, when Lyonesse again visit her betrothed, while everyone slept, the knight whom the hero had killed, once again attacked Gareth. In the furious fighting, Gareth killed this same knight. This time he was satisfied with just beheading the knight, Gareth cut the head into a hundred pieces, before throwing them out the window into the moat. Gareth fainted again, because his old wound had broke and bled some more, during the fighting. Lyonesse and Gringamore were distressed that their guest was attacked once again in their own home. Though, the wound had stopped bleeding, it would heal properly. Lynet returned with all the pieces of the head, and with her ointment, restored the dead knight, again. Gareth was upset with Lynet, but she told the hero that he was doing it for his and her sister's own goods. She wanted her sister to remain a virgin, until Lyonesse was married to Gareth. In Arthur's court at Caerleon, the three brother-knights arrived and yielded to Arthur, as Sir Beaumains (Gareth) had commanded. They told the king, how the young hero overcame each of them. They now served Beaumains as vassals. A few days later, Sir Ironside (the Red Knight of the Red Launds) arrived and surrendered himself to Sir Lancelot, as Beaumains had commanded him to do. Everyone was impressed that Beaumains had overcome Sir Ironside. Ironside then asked for Lancelot and Gawain's forgiveness, which they readily gave. Arthur then pardoned Ironside for his crime. On the feast of Pentecost, Morgawse, the Queen of Orkney and sister of Arthur, arrived at the court, demanding the whereabouts was her son, Gareth. She heard news that her son was made a kitchen knave for 12 months, she demanded explanation of the ill treatment of her son from her brother and her other sons. It was only then, that Sir Beaumains was really Gareth. Arthur and his nephew Gawain admitted to the angry queen that they didn't recognise him, nor did Gareth give them his name. They informed her how Lancelot knighted her son and how Gareth set out to rescue Lady Lyonesse. Arthur promised to find Gareth for his sister, but her son Gawain advised his uncle to send for Lady Lyonesse. When message arrived requesting the presence of Lady Lyonesse before King Arthur. Gareth preferred that his exact location remained unknown to those at Arthur's court. So Lady Lyonesse came to Arthur inviting them to turn up at a tournament that she has arranged on the day of the Virgin's Assumption. She reassured them that they would most likely have news of Gareth at the event. Then she returned home. Gareth was pleased with Lady Lyonesse's news, but was worried that his wound would not permit him to take part in the tournament. Lynet comforted Gareth, where she applied her ointment to heal Gareth, which seemed to miraculously make him whole. Lynet advised Gareth to call on all the knights that had become his vassals to join him in the tournament, while Arthur brought his own knights to Castle Perilous. Just before the tournament, Gareth wanted to enter the tournament, incognito, so Gringamore provided Gareth with a new set of armour and a horse. While Lyonesse provided Gareth with a magic ring. The ring had several wondrous properties: to enhance a woman's beauty, to magically change the colour of the armour, and to prevent loss of blood in combat. In the tournament, Gareth defeated many famous knights in the jousts, including his own brother Gawain. Each time, he unhorsed one knight, his armour and weapon would change colour. When Gareth took off Lyonesse's ring for a moment, someone recognised him. Gareth took off into the woods, hoping that no one would follow him. Gareth came to a castle of the Duke de la Rowse, where he welcomed by his wife, since the duke was absence. However, she warned him that her husband doesn't like any member of Arthur's Round Table. As Gareth rode towards the mountain, he encountered a knight named Sir Bendelaine. Bendelaine refused to let anyone through the pass, unless a travelling knight jousts with him. So Gareth ran his lance through Bendelaine. Mortally wounded, the knight fled to his castle, where he died. Twenty armed men seeing that lord had been slain, so they attacked Gareth. When they could not overcome the young hero, they killed his horse. Yet, they were still no matches for Gareth, even when the hero was on foot. Gareth began killing them, one by one, until only four of them fled. Gareth took one of the horses from his attacker and departed. Gareth rode and arrived at another castle, where he heard 30 ladies and gentlewomen mourning. Gareth discovered that the women were widows, because the lord of the castle was the Brown Knight without Pity, who had killed their husbands. Gareth challenged and killed the Brown Knight, by running his lance through his enemy. In the morning, Gareth sends the ladies to Arthur's court, before he departed in the other direction. The hero arrived at the mountain, where Duke de la Rowse, whose castle he had stayed in the previous nights, challenged him in combat. The Duke challenged him. Gareth unhorsed the Duke, then defeated him with his sword. Gareth spared him and sends him also to Arthur. As the Duke departed, another knight arrived. Without a word of challenge from either side, they jousted. The knight wounded Gareth in his side with his lance. They continued their fight with their swords for two hours. The fight ended when Lynet arrived. She shouted to the other knight, who was Gawain, to stop fighting his brother Gareth. Upon hearing his brother's name, Gawain threw his sword and shield aside and kneeled to his younger brother, because he yielded. Gareth realising that he had fought his brother, threw aside his arms, and yielded. The brothers wept as they embraced. Lynet attended to the wounds of both knights. Gawain had Lynet to bring to the king to them, since their horses were too weak to be ridden. With the king, came Morgawse and the entire the court. Arthur made arrangement for the marriage between his nephew Gareth and Lyonesse. They were married on the feast of Michelmas, at Castle Perilous. The knights whom Gareth had defeated, including Sir Ironside, the three brother knights and Duke de la Rowse, had not only become Gareth's vassals, but were also given places in the Round Table. Gareth two older brothers were married on the same day: Gaheris to the now Lady Lynet, and Agravain to Lyonesse's niece. Friendship developed between Lancelot and Gareth, because Gareth admired the great hero so much. Unfortunately, a day will come when one will deal an accidental death to the other, will be one of a series of event, which split the Round Table apart. So end the tale of Sir Gareth of Orkney. First Created (Tales of the Knights): 12/04/2000.